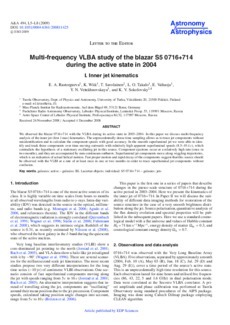 We observed the blazar 0716+714 with the VLBA during its active state in 2003�04. In this paper we discuss multi-frequency analysis of the inner jet (first 1 mas) kinematics. The unprecedentedly dense time sampling allows us to trace jet components without misidentification and to calculate the component speeds with good accuracy. In the smooth superluminal jet we were able to identify and track three components over time moving outwards with relatively high apparent superluminal speeds (8.5�.4 c), which contradicts the hypothesis of a stationary oscillating jet in this source. Component ejections occur at a relatively high rate (once in two months), and they are accompanied by mm-continuum outbursts. Superluminal jet components move along wiggling trajectories, which is an indication of actual helical motion. Fast proper motion and rapid decay of the components suggest that this source should be observed with the VLBI at a rate of at least once in one or two months in order to trace superluminal jet components without confusion.